Not bad. Not good, but EXTRAORDINARILY SPECTACULAR! Nice job. Dude, this is really good stuff! It sounds just like something Tom would write! excellent job! How bout you make it into a movie after your done with the week of papertine and I finish the story? And thank you Ultra Folder JC. Aaaw….UltraFolder….thanks, dude! You rock, CJ! You rock, too JC! And you have good reasons to be an ultra folder. 1. You’ve been a super folder long before I have, I only started a little before this January! and 2.You’ve done a lot of cool things in the Origami Yoda community! Will you be in my movie as Harvey? I had no idea how much you looked like him! Sure! Did you know I actually don’t wear glasses? I just wear them for the role, and I borrow my mom’s old ones. In real life, I look more like, well, my character from The Eraser Parts 1 and 2! I barely wear my glasses, but sometimes cuz im a little far sighted i think. Hey JC? Do you live anywhere in the eastern time of the united states? And actually, I would rather have a origami Mace Windu then origami Jar Jar Binks for Mike’s paper puppet if you dont mind. How cool! (Now, online we can’t like share addresses or anything, so yeah, same STATE!! That’s cool, huh? And will you help me with the Jango Fett-Fortune story, JC? Yeah! I’ll do the rest for the EU Book, if you’d like! I REALLY like this story! I’ll finish this story today or tomorrow! I’M DONE WITH THE STORY! YEAHHHHH!!!! I live so close! I live in NJ! I am so going to doodle on this! Can my paper craft series be put on here again?? No way I am gonna be like Tony! NICE!! You use the same style of writing I do! You’re probably even R.L. Stine level! This is amazing. Let me know if there is anything I can do to become a Superfolder or help out with your movie! Holy cow! This is Shakespearean! Did not. He went to help another child like Dwight at another school. guess what?I,ve made a a case file written by……….ORIGAMI YODA HIMSELF! Anyone have any ideas for my story The Evil Rise of Kylogami Ren? If so some tell go to andy9807.wordpress.com and tell me! i have an idea for a case file called -attack of the folds- its about a group of bullies as the sith lords coming to create a separatist movement and the rebellion must do what theyve never done; fight for the empire. a bunch of crazy things also happen- kellen, tommy and lance have joined the dark side. origami yoda comes back as well. and harvey even becomes foldi-wan. Hey where’s JC on the website nowadays? Anyway this is a good story. Hey, guys! Back with the old name for this story! FunTime is defeated! It’s gone forever…though we only have one week of school left. Heh. Looks like we banished FunTime from this school a little too late in the school year. At least we have our electives back and took our field trip. Today me and Kellen were sitting down at lunch when this kid, who introduced himself as Tony, came up to us. Tony sat down at our table. He pulled out an origami Jango Fett. “I heard Star Wars origami’s popular here. I made an origami Jango Fett from Attack of the Clones. 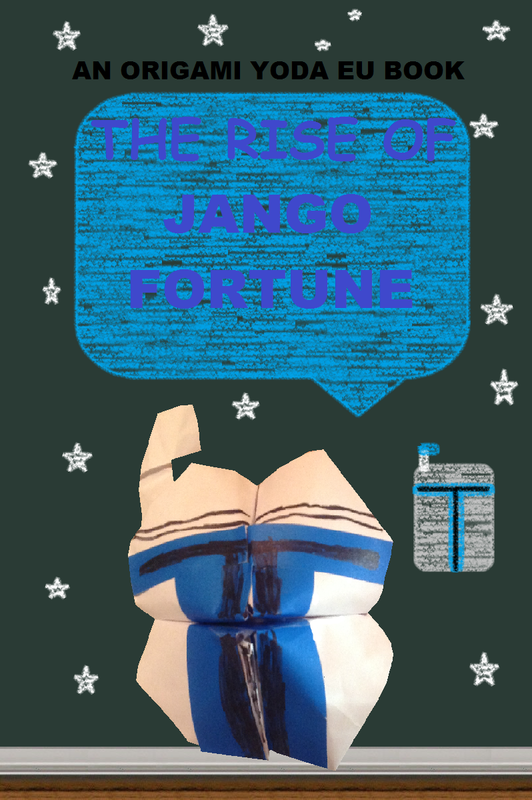 His name’s Jango Fortune. He’s a fortune teller.” Tony’s Jango Fortune was almost as big as Sara’s Fortune Wookiee. “You can get your fortune told for only…say…one dime,” Tony said. “Deal,” Kellen said. Jango Fortune’s fortune for Kellen said: “You will get a tasty treat later due to plain luck.” Later that day, Kellen told me he got a free ice cream cone from the local ice cream stand because he was their 100th customer! And that person was me. During gym class, we played dodge-ball. Tater Tot mistook me for a ball at one point and slammed me across the gym. I got a blood nose, and Harvey and Tony were laughing like crazy! “Are you okay, little dude?” Tater Tot said to me. “Kinda..,” I said back to him. I then fainted. Um…this is…uh…Kellen and…uh…his…ummm…..recording…uh…thingie. Can you…um…erase all those “um”s and “uh”s? Today me, Tommy, Lance, Kellen, Sara, an embarrassed Rhondella, and Mike confronted Tony and Jango. But guess who was with him. That’s right…Zack Martin! And that other meanie who Kellen once saw making out with Rhondella, John Oxley! “Ah, So this is the famous Amy,” Tony said. “Much more pretty than in your friend Kellen Campbell’s insolent drawings.” He tried to kiss my hand, but I pulled away just in time! “Ah, a feisty one, she is,” Tony said. He went to John Oxley and said, “I like her.” John Oxley nodded at his boss. I can’t believe it! Harvey and Darth Paper and the Edu-Fun Empire may have been something, but this is…going too far! Tony is the only enemy of ours who has successfully teamed up and made allies with the nostrul bullies here like Zack and John! And the only one to publicly humiliate more than one of us using only his puppet in one hand and an iron fist in his other hand. Right after Tony said, “I liked her,” Lance went up to Tony and gave him a big ol’ wedgie. Tony tried to punch Lance after that, but Lance throwed Tony into an open locker and tried to stuff him in there, probably hurting Tony a lot. “It’s the only way,” Lance said. “Never!” Lance said back to him. “Have it your way. Boys! Kick him out of school!” Tony said smugly. John Oxley picked up Lance by the head, kicked the school doors opened, and kicked him out of the school. Literally. Chapter 5: Lance, What Have You Done?! So, later that day, I’d been thinking about what Tony said earlier today. To be fair, Amy was one of the main reasons I joined the Origami Rebel Alliance, not FunTime (though Gizmo was pretty annoying). I mean, I love Amy and all, but she had gotten me in trouble several times before with Rabbski just so she should tell Rabbski about her math calculations about FunTime. Those little calculations. Those puny little calculations. Those puny little [bleeping] calculations!!!!! I’ve decided ONE thing and ONE thing only: Tony is kinda right! In fact, he IS totally right! Amy has been using me just to show the principal her insolent math work! Today, after I realized Tony was right all along, I quickly ran up to the phone in my house and called Tony. Chapter 6: The End Of Tony’s Reign! These last few days have been full of humiliation, betrayal, and much, much more, all thanks to me and Kellen letting Tony into our lives that fateful Monday earlier this week! So today all of us—even people who haven’t been involved in this Jango Fortune business, like Murky or James Suervo Jr.—confronted Tony, Jango, and Lance! “Hello there, friend,” Tony said to me. “You…you little monster,” I said. Lance then went all kamikaze on Tony, took out an origami Boba Fett, gave Tony a big painful-looking paper cut with the Boba Fett puppet, and slammed Tony onto the floor. Tony then ran away, with a shredded Jango Fortune in Lance’s hands. Anyways, critique is allowed. This is gonna be the type of writing style you’re gonna see in OrgiVdnom. Like what you see?